In the last few days there has been talk on the twittersphere about retrieval apps. First mock-up – content required! Clearly offline functionality will be essential – 3G coverage on the far side of Great Barrier Island may be patchy at best…! The current plan is to build the app online and test it through the online iPhone simulator prior to testing on devices and eventually distributing it through the app store. An excellent podcast from SMACC 2013 about medical app development can be found HERE. Do any readers of this blog have any experience with app development? Please feel free to share pearls and pitfalls using the comments section below. We will keep you posted on how this project progresses – watch this space! 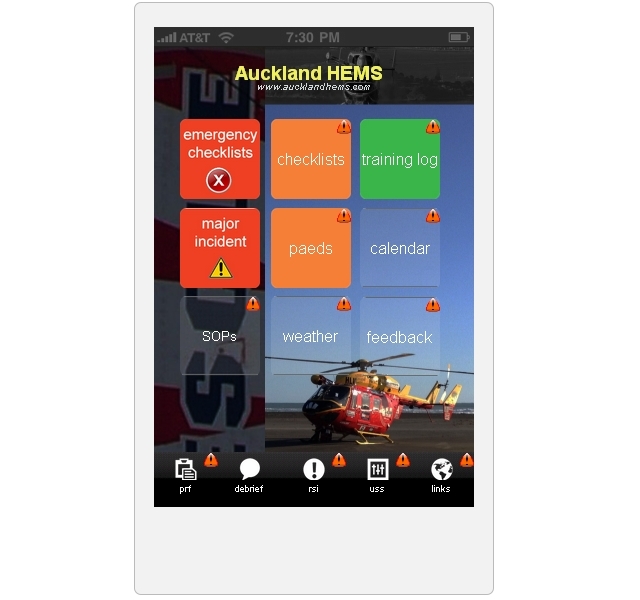 This slideshow, assembled by Dr Chris Denny, shows the ARHT & Auckland HEMS team during the first two years of the HEMS initiative. It was presented at a recent strategic planning meeting to plot the future course of the service. The gentleman whose photo is shown at the start is the late Dr Robin Mitchell, a UK-trained emergency physician who was instrumental in laying the groundwork for Auckland HEMS. Have we been waiting for this! In the latest edition of Air Medical Journal the British Columbia Ambulance Service’s AirEvac And Critical Care Operations has published a case series detailing the use of tranexamic aid by flight paramedics. The abstract for the paper can be found HERE. The paper details 13 patients who recieved TXA over a 4 month period, with 9 patients from MVAs, 3 patients who had fallen, and one industrial accident. The average time to administration of TXA from first patient contact was 32 minutes. No complications were reported. The authors make the point that while tranexamic acid in theory has more benefit in major trauma the earlier it is administered, the importance of it should not be overplayed. Its use occurs in their protocol after a primary survey has occurred, critical interventions have been done, and transport has been initiated. They also mention several cases where the patient met the criteria for TXA use but it was not administered, as the practitioners (who were balancing critical interventions, resuscitation, and short flight times) felt other elements of care had to take priority.